Note- At one point, I read the following, "Don't have anything in your portfolio that you need to make excuses for." It was from Patti Digh's book Life is a Verb. And I think it's great advice. Lately, though, I've felt that sentence hanging over me every time I work on something to post about here. And I have to say, it's caused a fair amount of creative drain, causing me to hold everything I want to post against my highest standards. I am still creating a bit, just not taking pictures and not sharing the story. And every day that passes that I don't post, the bar gets higher and higher and my creative urges get fewer and fewer. Which is sad because my underlying goal here is to encourage people to try things. To start badly and then improve. To do it for the thrill of making. Of trying. Luckily I found this post by Paul Overton reminding us of the importance of not being too attached to the wonderfulness of what we produce. Noah Scalin referred to it as "letting go of preciousness." So what follows will not be that wonderful. It isn't a helpful tutorial or a rousing tale of success and it only has a couple of pictures, way down at the bottom. It *is* a little story about me trying something new. Which might be just as worthwhile. I recently figured it was time to knit a sweater. I realize that not everyone comes to this decision at some point in their lives, but well, I have. Up until now I mostly knit just for the sake of knitting. I actually enjoy the feel of making the stitches. I just rarely make anything practical (other than the odd giant headband). 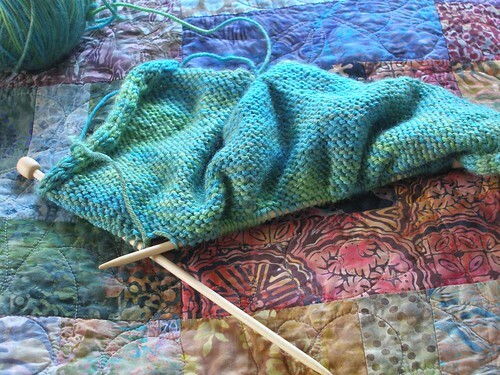 Just knitting and frogging, over and over. So after hours searching on Ravelry, I finally found a pattern and yarn. Yarn, it turns out, that no one carries in an actual store in my neck of the woods. So I chose something else because the idea of buying yarn that I hadn't been able to rub against my face just seemed crazy. Yes, I am that weirdo next to you at the store who cuddles with the merchandise. The process of buying yarn was so involved (should I get this one? yes. no, wait. how bout that one? ya know, I think I like that first one after all) that by the time I'd left the store and walked to my car I felt like punching my fist into the air like Judd Nelson as if to say "Take that, yarn store! Your plethora of choices and lack of what I'd actually wanted to buy did not defeat me!" I didn't do it, but I wanted to. As I drove away, I wasn't even dismayed at the immense distance between the thousand or so yards of fiber in my bag and the sweater I would be attempting to twiddle it into with a couple of bamboo sticks. Clearly I was delusional. But I'd at least managed to procure the raw materials for the project. Surprisingly, the knitting gods were smiling on me (well, other than the wreck I created while trying to wind my first center pull ball, but I'll get to that). I cast on the right number of stitches on the *first try*. And my stockinette stitches were nice and even and also (get this) the correct gauge right off the bat, even though I forgot to knit a test swatch. Now normally I knit like a child, handing it over to a more experienced knitter (my little sister, actually) whenever I mess something up. I'd recently joined a knitting club in which other grown women do this same thing with no embarrassment whatsoever. But this project would be different. *I* was going to do it all by myself. And I knew that if I dropped a stitch, I would pick it up myself. I also realize that this is quite possibly the lamest drinking story ever told. Eventually, I simply put my work on a shelf in the closet, next to my first attempt at winding a center pull ball, which was currently a knotted up pile of sad. But boy howdy, the next day? The next day I pulled that sucker out and fixed it! Yes, I realize that using a crochet hook to pull a couple loops of yarn through other loops of yarn probably doesn't necessitate the exclamation mark. But this image from this post came to mind and I cracked up because I felt the same sense of purpose and accomplishment. This is what I have so far. 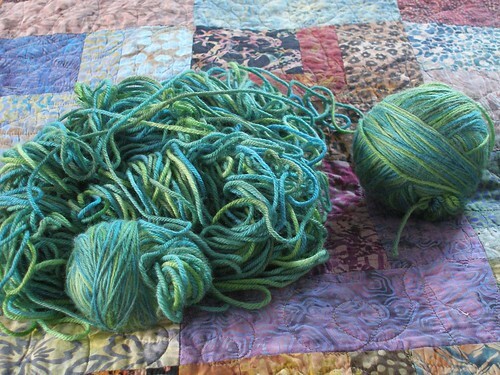 About a hundred yards of yarn fooled into thinking it's a 1 x 2 foot piece of cloth. Now if I can just convince that cloth that it's a sweater. So, what do you think? Do you prefer finished projects with lots of pictures or did you enjoy this glimpse into the crazy? Give me the crazy every time! LOL! i love your crazy. and your neat. i'll take em both. this was a gorgeous piece of prose. funny, honest and sweet with a little life lesson at the end. well done. and thank you for the links about letting go of your little perfect. boy do i hang on. This was the most entertaining thing I've read all day. I always like the way you write. I've basically stopped blogging because I even if I can cobble together a post over a few days time with all the interruptions in my life, I'm never satisfied with the topics or content. I appreciate hearing your take on this. Love this. It's really quite prophetic, actually. Sometimes I get in such a hurry that I forget about the process and just want the end. This cracked me up! Like Latisha, I love the crazy and the neat... I have one of those yarn messes in my closet and I breathed a huge sigh of relief that I wasn't alone in the yarn ball winding failure! Thanks for the chuckle... I love your blog. I just like hearing from you more often, finished project or not. I crack up every time I read the blurb about the headband. I'm happy for you for jumping back into knitting. I'd take the 'crazy' over 'perfect' any day. The blogs that only show perfect, finished things are demotivating to me because I can't attain perfection. But trying something new? That I can do. I follow several blogs written by mothers, and BY FAR the most comforting, encouraging, and inspiring posts are the ones where the writer posts about the bad as well as the good. It's wonderful to know you guys aren't perfect - you make mistakes, just like I do. And that's incredibly comforting on bad days where nothing seems to go right at all. I would rather see one or two posts a week outlining "crazy" rather than a single post once a month in which everything went perfectly. 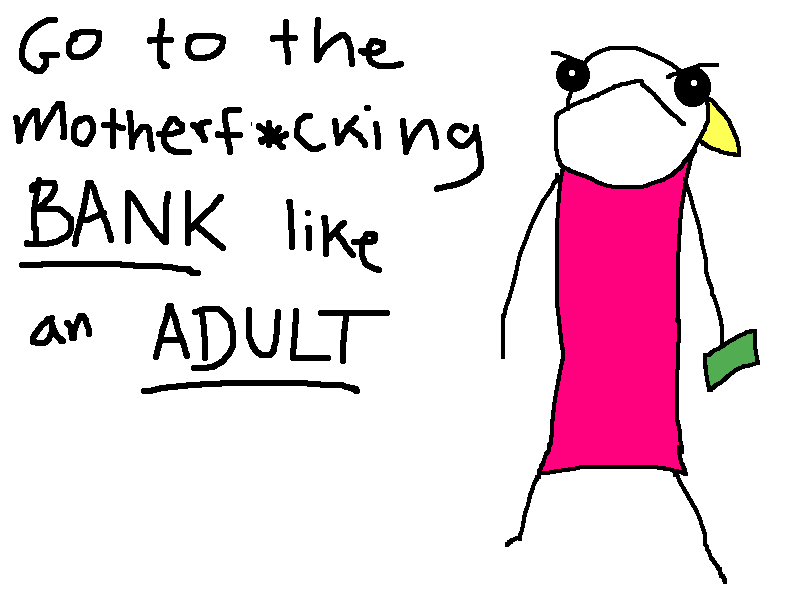 Reading a blog where everything goes swimmingly, every time, actually leads to depression. "Why can't I be like that? What's wrong with me? What does she have that I don't have?" Makes a woman feel inferior. I love seeing struggles and mistakes and attempts on the blogs I read. I struggle a lot to try new things and give them enough of a chance to get better at them. I tend to want perfection right off the bat and that's not realistic. That said..The process is so much more satisfying than the end product to me, sometimes, that I have tons of "processes" in my closet below the stairs waiting patiently for me to end each and every one!!!!! This is why I love reading your crazy, imperfect blog....You remind me of me!!!! Keep on being, my dear...it's who you are and that is perfect!!!!! I'm with the crazy, I'm always stuffing up!!!! heh, your sentiments really spoke to me! I've been having the same thoughts over at Dabbled ... ! This is perfect and real and reassuring. Bravo! Thank you for this post! This type of post is why I enjoy reading your blog. I love the little insight you give into how you approach life and projects. Keep it coming. the first time I knit, I just knit and knit and knit. BEcause I don't know patterns, it didn't turn out to be anything either. I thought tree cozy, but that didn't turn out that well either. Your's would be a cool headband though. I think you know that I appreciate Crazy more than Finished any day of the week. And, HELLO, anyone who's ever knit a stitch knows the siren song of The Knitted Sweater and also the soul-crushing defeat of a drunkenly dropped mystery stitch. You forge ahead, sister - one day we'll be toasting your mighty sweater accomplishment. I love it all! Thanks to your crazy, which happened to also be quite inspirational, I have started a baby blanket for a friend. Thanks! I love glimpses into the crazy! Though you wrapped it all up so neat that it was crazy AND neat AND inspirational AND that yarn is simply delicious. How's the convincing going? Has it agreed to become a sweater? 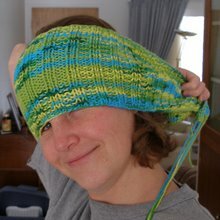 I also put up a link in my sidebar to your beautiful luminarias - something on my "must try someday" list.